Fangirls, I love cookbooks. I think they’re fabulous, and that may come from growing up in a house where we have never had fewer than ten (some recipes you can not get rid of, and it’s easier to keep their books than to write down your favorites). I have a(n unofficial) Harry Potter cookbook, that I love so much because Harry Potter is one of my favorite things, and cooking is another! Plus the idea of fandom related snacks really speaks to me (obviously). 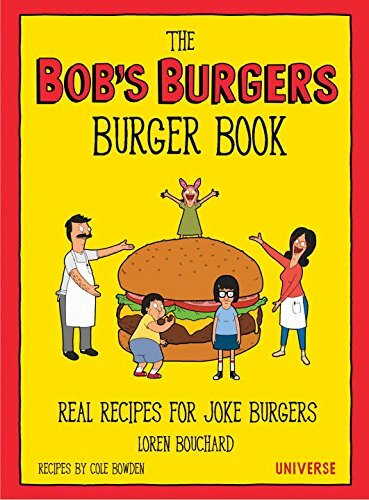 So when the Bob’s Burgers Burger Book was announced last year, I totally lost my mind. I adore Bob’s Burgers, both the show and the comic, so of course I wanted the book! The biggest thing that I had to remember while going through this book was that recipes will need to be changed for me. Being a vegetarian with a book devoted to cooking burgers is probably the silliest thing ever, but I like to make my own black bean burgers, and I’ll eat the frozen ones. Now I just have new ways to top them, and with puns! This book is wonderful, with tons of information, amazing illustrations, and jokes up the wazzoo. It’s the perfect tribute to the show, with recipes that were either featured in an episode or just on Bob’s blackboard in the background. Each recipe tells you which episode it’s from, which I think is beyond fantastic. I will be making burgers then sitting down to watch the episode that they’re from. Also, this book is not small. It’s 127 pages packed with sweet recipes, the best way to make your own french fries and how to make the perfect burger. I’m really excited to modify and try the Poutine on the Ritz recipe for a poutine covered burger, with poutine on the side. I’ll probably just stick to the poutine at first, because it sounds like a lot of food otherwise, but I’m excited. If you like puns, goofy comedies, and cooking, I can not recommend this book enough. 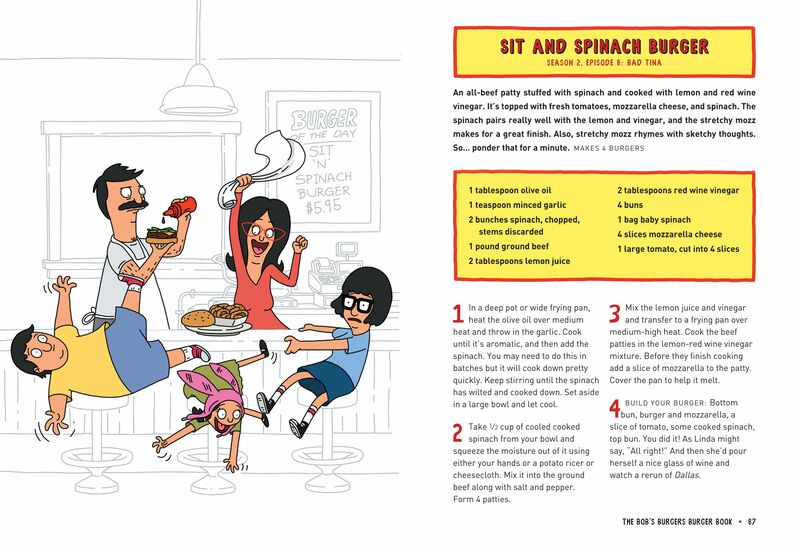 It’s silly, has the exact same tone as Bob’s Burgers the show, and is chock full of rad recipes!